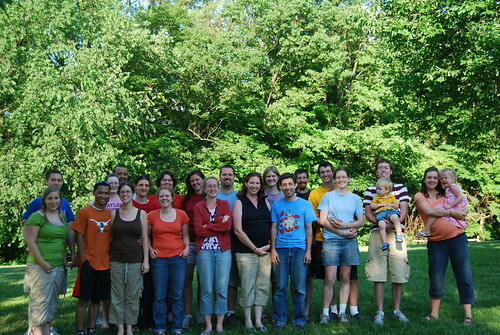 I’ve been meaning to write a recap about the Gerig Hall reunion this year, as I’ve done with every other year (2007, 2008). This year was really great; we had a good turnout including a number of people who came for the first time! We decided that the beginning of June worked best for people. 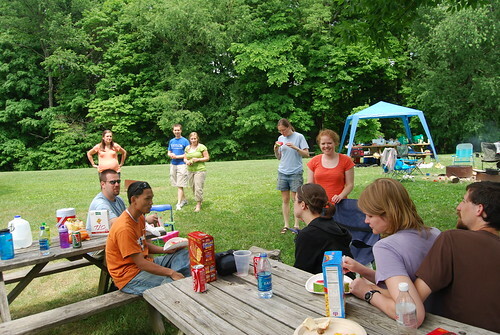 Last year, we had an August reunion (end of summer) and we found that for several people, the summers got extremely busy by then. So we’ll focus more on June in the future. 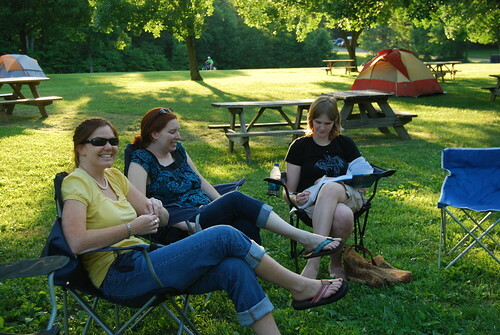 We camped at one of the group sites at Brown County State Park in Indiana. 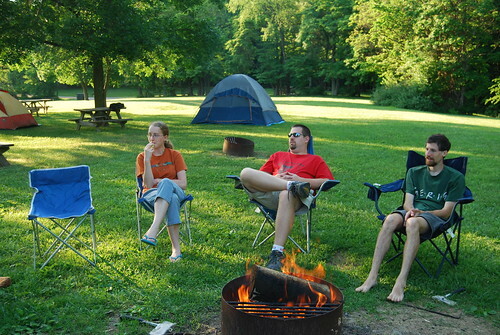 I really like those sites, because it’s basically a big grassy field with a few picnic tables scattered around, and you can set up your tents wherever. 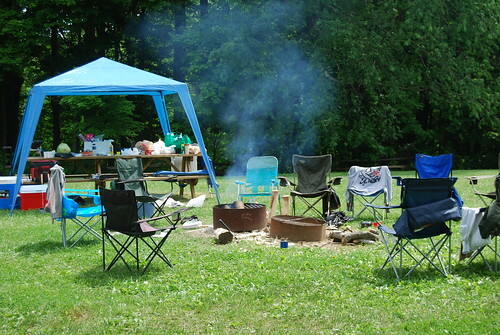 We spent most of our time hanging around the fire pit in our camp chairs, except during the heat of the day when we retreated to the shady area where some of the other picnic tables were. Speaking of pregnant ladies, we had two this year! :-) We were all surprised that at 39 weeks along, Beth was brave enough to make the 2 1/2 hour trip to hang out with us for the day! She did great but I definitely noticed that she wasn’t quite as peppy as she normally is. It was great to see her. (This is the only picture I have of me.) I was 6 months along at this point – it was actually my first week in my third trimester! 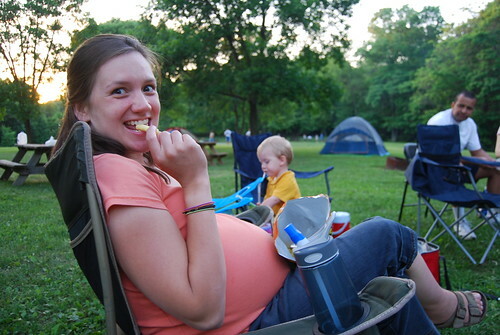 Haha I bet not very many women go tent camping in their third trimester. :-) That part ended up being fine. I had brought lots of pillows and sleeping wasn’t a problem. I did join any group of girls walking to the bathroom, which was probably good exercise for me, and it really wasn’t as much of a pain as I anticipated. 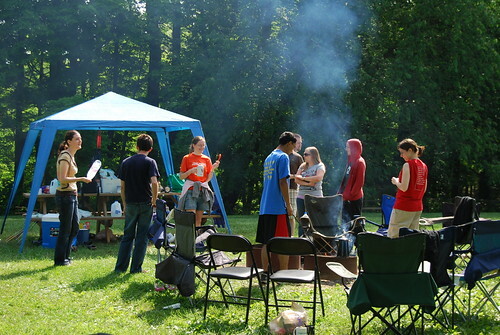 The hardest part actually was in setting up and taking down the tents/campsite. Poor Paul ended up having to do a lot by himself. It was partly the heat – it wasn’t really that hot, but there was no relief in the middle of the day on Sunday when we packed to leave (no air conditioning!). Overall, I think we all had a really great time. It was so encouraging to me that people were talking about looking forward to the reunion, and also about wanting to make the effort to come to not only this reunion but future reunions as well. Some people traveled great distances – Melissa, and Sopeak and Zay all drove from Texas. Zay had to work on the Friday before the reunion, so she and Sopeak left Texas after she was done, arriving at the campsite at 5am! It was so great to see all of them. Melissa normally lives overseas but was in the States for a few months, so it worked out for her to come and it was SO great to see her again! Joanna came all the way from her home in Florida. It was her first time attending and we were all so glad she was able to make it! Matt and Alisse weren’t interested in camping, so they stayed at a nearby cabin so we were still able to see them all weekend which was really wonderful! It was so great to see every person who came, and I hope everyone is able to come back next year! 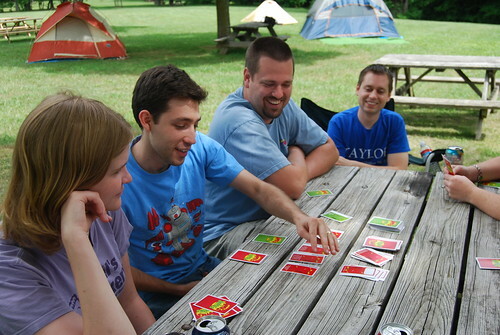 It was a wonderful, refreshing weekend and I really can’t wait until October when we go up to Indiana again for Isaac’s wedding, and we get to see a lot of people again! Actually, our hope is to actually go back to Taylor’s campus – we haven’t been there since my graduation in 2005. We are craving some Ivanhoe’s! Ah, friends. This was the best part of college, hands down. Alisse: It’s also Paul’s 5 year reunion this year! So we’re excited that we’re actually able to GO to homecoming. I think we’re going to plan a few extra days so we can see everyone and do everything we want to do without overwhelming the baby – and go to Ivanhoe’s and avoid the crowd. ;-) I’m excited! Are y’all going to be there? We will be there! I haven’t been back to Taylor since my graduation… is that right? So yes, we will be there! I’m excited to see the baby! I hope I can make it this year!!! !